Modern Frankfurt, Germany is a major hub for European river cruises on the Main River and mighty Rhine River, and with one of Europe's largest airports, it is a major starting and ending point for European river cruises. As you explore this modern metropolitan gem, you will see a reconstructed Old Town, known as Römerberg, similar to the original that was largely destroyed during World War II. There are a number of museums and cathedrals to explore, including the home (and now museum) of 18th century writer Johann Wolfgang von Goethe and the Städel Art Museum. Make sure to ascend to the top of the 56-story Main Tower for a panoramic view of the city! Contact one of our European cruise experts when you're ready to start planning your European cruise from Frankfurt! Explore three extraordinary rivers: the enchanting Rhine, the graceful Moselle, and the charming Main, on this incredible 7-day cruise aboard the MS Lafayette. Embark in Strasbourg, France and explore Germany's historic towns of Frankfurt, Cochem, Koblenz, and Rudesheim, visiting ancient vineyards, picturesque villages, and the Rock of Lorelei. Discover three extraordinary rivers: the enchanting Rhine, the graceful Moselle, and the charming Main, on this incredible 7-day cruise exploring this romantic region. Delight yourself with the enchanting city of Frankfurt with its mix of ancient and modern sites that are sure to astonish you. Join MS Symphonie on its 9-day cruise that begins on Strasbourg and disembarks in Vienna. Discover the natural beauty of people, culture and environment as you sail from one river to another! Join the luxurious MS L'Europe and discover the enchanting and historical cities of Frankfurt, Rothenburg, Nuremberg, Regensburg, Vienna, and Budapest on this once-in-a-lifetime adventure cruising along some of the most emblematic countries of Central Europe. Discover Frankfurt, the Abbey of Melk, Vienna, Schönbrunn Palace, and the historical city of Budapest, a great example of an authentic European town with more than 1,000 years of history. Explore Central Europe in the comfort of your luxury ship the MS France. 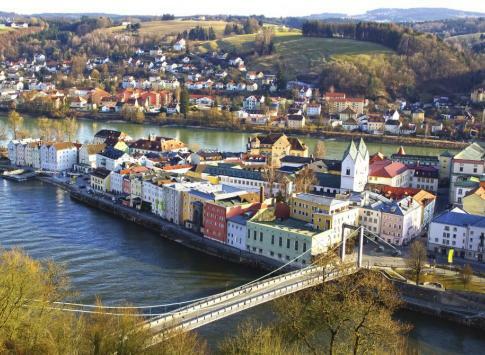 This 9-day cruising adventure aboard the MS Beethoven journeys along the beautiful Danube and Rhine Rivers, from Vienna, Austria to Strasbourg, France, stopping in the traditional German towns of Regensburg, Nuremberg, Schweinfurt, Gerlachshausen, Würzburg, Karlstad, Wertheim, Miltenberg, Frankfurt, and Mainz along the way. Board the MS Symphonie for a 19-day river experience through the enchanting waterways of Holland all the way to Danube. Sail along the romantic Rhine River making stops in quaint villages, imposing gardens, lush vineyards, and dazzling cities, including Amsterdam, Rudesheim, Heidelberg, and Mannheim. Explore a major banking hub in central Germany on the Main River - Frankfurt! Try some of the local brews! Visit the reconstructed Old Town to see what this city once looked like.